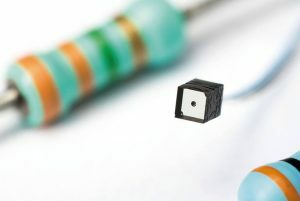 AMS is to create a camera 1mm across for space-constrained industrial and consumer designs, intending to add imaging to products such as smart toys and home appliances. Called NanEyeM, the business end is 1 x 1mm has a 100kpixel sensor with a 10bit digital readout. Inside is a multi-element lens, claimed to reduce distortion compared to similar cameras with a single-element lens. According to the firm the modulation transfer function (MTF) is >50% in the corners, distortion is <15% and color aberration is <1Px. The interface is configured as a slave, allowing the application to control frame rate, which can be slower than 1frame/s. By providing a central clock from the application processor, two or more cameras can be synchronised for eye tracking or stereo vision. An idle mode reduces power consumption in applications such as presence detection need only a small number of frames per minute.